Students applying for an Agro-home placement must have a love for children, as their main responsibility will be the care of the family children. The experience offered by families hosting Agro-Home student is all about domestic management, childcare and personal development. Taking responsibility for someone children will help to grow confidence and a sense of purpose. 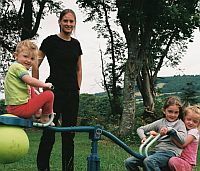 As well as childcare, students will learn how to run the household and what it takes to manage the daily tasks of keeping a rural family happy and their lives ticking along. This will involve getting to grips with the daily household chores, like washing up, cleaning the kitchen, sorting laundry, tidying a playroom or preparing dinner. Understanding the household budget and planning the weekly meals and activities all take time and organisational skills.